N44CE seats up to 12 passengers and can travel 4,200 nautical miles or 8.5 hours non-stop. Cruise airspeed is 460 kts at altitudes of up to 45,000 feet. 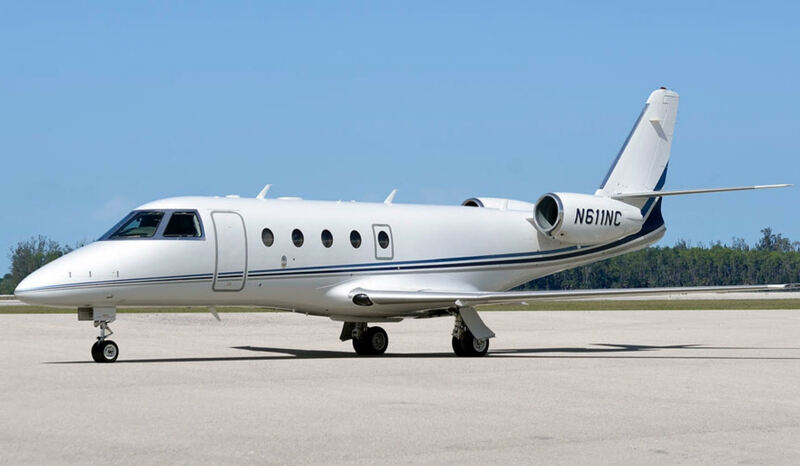 The Gulfstream IV is outfitted with WIFI, 2 monitors, a DVD player, satphone, airshow display and a galley that can accommodate almost any catering request. The Gulfstream IV had new paint and interior work in 2004. N776MA seats up to 13 passengers and can travel up to 4,200 nautical miles or 8.5 hours non-stop. Cruise airspeed is 460 kts at altitudes of up to 45,000 feet. The Gulfstream IV is equipped with WIFI monitors, a DVD player, airshow display, and a full galley that can accomodate almost any catering request. The aircraft was fully refurbished with a new interior and paint in 2014. N611NC seats up to 7 passengers and can travel up to 2,800 nautical miles or approximately 6 hours at a cruise speed of 450 knots. The G-150 is equipped with an airshow display, DVD player, and galley. N876MA & N876SF seat up to 7 passengers and can travel 2,400 nautical miles or 4.5 hours non-stop. Cruise speed is 450 kts at approximately 40,000 feet. The Learjet 60 is equipped with WiFi, XM Radio, 3 monitors, a DVD player, airshow display, and a snack bar.